his article gives the lengths of indicator spindles for Sturmey-Archer internal-gear hubs. There is much more compatibility than you might think. Though a shorter spindle may be more difficult to install and adjust, it will work unless its chain sinks all the way in when the cable is loosest. A longer spindle will work unless its chain pulls it sideways when the cable is tightest. Please read this article in connection with the article on tech tips for Sturmey-Archer hubs, which gives advice on how to install and adjust indicator spindles. The table at the end of this article lists the various indicator spindles, along with the hubs with which they are meant to be used. A companion article describes how to determine the correct length of an indicator spindle by measuring hub parts. That can be useful if you can't identify the hub, or it is not on our list. We give indicator-spindle part numbers for some hubs from the 1930s and earlier, but for purts lists, you'll have to go to Tony Hadland's site or the Sturmey-Archer Heritage site. 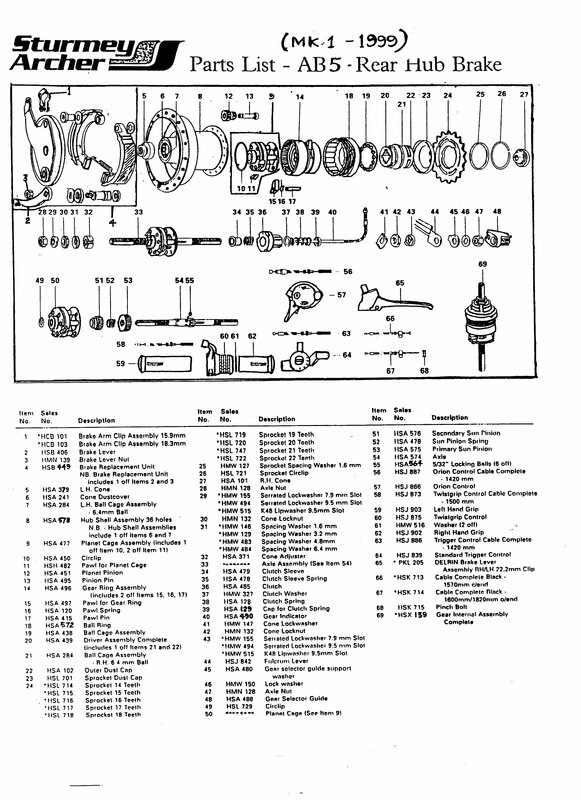 Chapter 1 of Sutherland's Handbook of Coaster Brakes and Internally-Geared Hubs, on this site, gives more detail on indicator spindle lengths for hubs up through 1992. 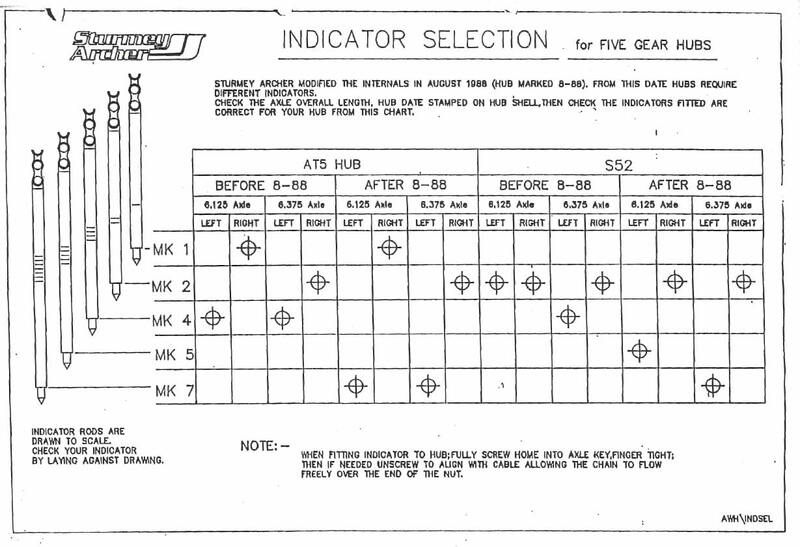 And here is a table giving indicator-spindles for older and newer production of the S5/2 and AT5 hubs. We still need measurements for a few spindles. Please feel free to send measurements in. We will credit you for your contribution. Some spindles are thick, and are identified by through hash marks or Roman numerals. The effective length is from the base of the threads to the shoulder before the first link of chain (points of the green arrow in the image below). Spindles for most newer hubs are thinner, as shown in the image below. Some hubs accept only thin spindles. Each model of these newer spindles has a different-colored painted mark, which may be on the rod, or on the chain. Check the color of the mark under sunlight, because the blue and purple colors can easily be confused under indoor lighting. The red arrow in the image indicates the length from the base of the threads to the mark. No matter where the mark is, the length which most affects compatibility is from the base of the threads to the shoulder, indicated by the green arrow. When using an indicator with paint marks on the chain, it is a good idea to make a mechanical markon the chain and/or to photograph the indicator: the paint is often obscured by dirt or simply falls off. If you are using a spindle which is not standard for the hub, you will have to adjust it by testing operation of the gears, rather than by aligning the mark. That is a good idea anyway. Generally, the cable should be just short of taut in the tightest position. Exception: the S5 with bellcrank: the cable should be taut. The hole in the end of the axle is large enough for a thick spindle, but there is an internal part with a smaller-diameter opening. The red arrow in the image below points to that part in a cross-sectional drawing of the axle. The part presses against a compression spring. The spring, in turn, pushes the clutch inwards against the outwards pull of the indicator spindle. Spindle lengths are rounded to the nearest millimeter. Thanks go to Jan Blaha, Dan Burkhart, Tony Hadland, Elton Pope-Lance, Howard Sutherland, eBay vendor cyclingcolors_france and David Prosser of Sturmey-Archer for some of these measurements. Special thanks go to Bruce Dance for his many suggestions and corrections. Click on the link below to switch the order in the table between part number and spindle length. You may have to double-click the first time. Table sorted by part number -- click on link above to sort by spindle length. Thick indicator spindles are listed first, then thin ones. Thick ones will not work in some hubs. Thin ones will work in any hub if the length is OK.
S5/2 L before 8-88 6 3/8"
Indicator spindles identified by Roman numerals are fat and will not work in some hubs. Thin indicator spindles will work in any hub if the length is OK. The parts list for the AB5 on the Sturmey-Archer Heritage site gives HSA490 for the indicator spindle. This is almost certainly incorrect; several other part numbers also. Except for the 90mm brake assembly and steel shell, the parts shown in the drawing for the AB5 are identical to those for the X-RD5. These are both ball-locking hubs and the correct indicator spindle is HSA317.